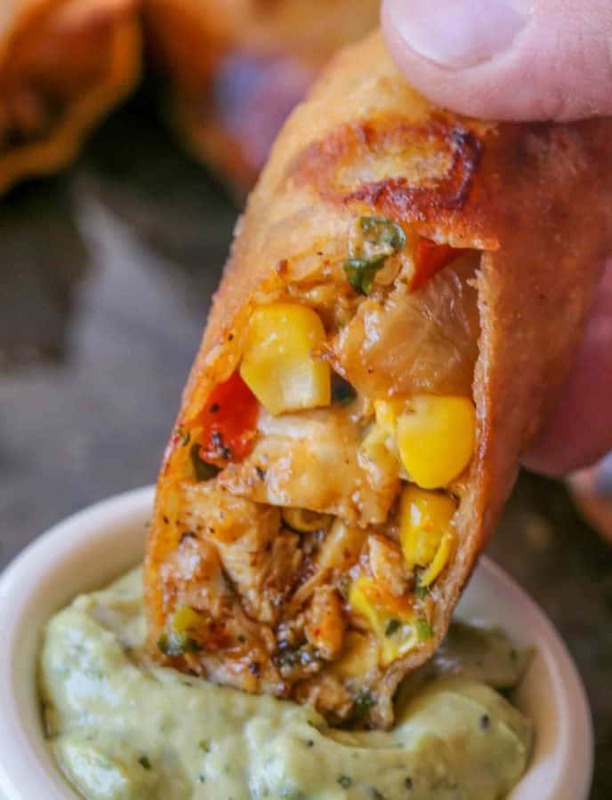 Cheesecake Factory Tex Mex Egg Rolls Copycat made with spiced chicken, beans, corn, bell peppers, onions, garlic, cilantro and cheddar cheese in a crispy egg roll with creamy avocado cilantro dipping sauce. 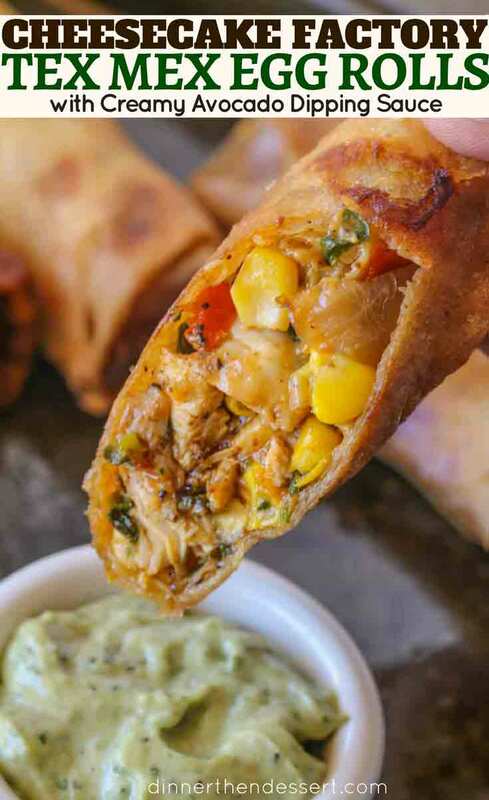 These tex mex egg rolls are delicious and a favorite in our house like the Philly Cheesesteak Egg Rolls and Korean Ground Beef Egg Rolls we make for parties and Asian fusion meals. 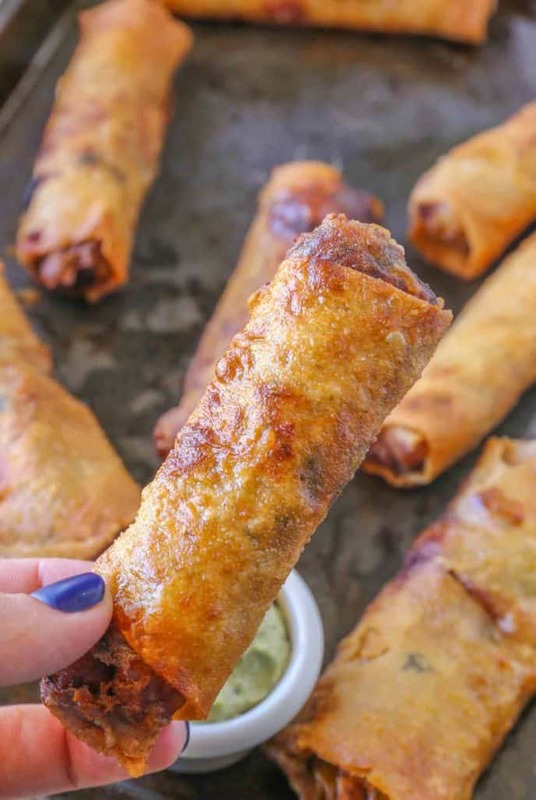 Appetizer egg rolls are an awesome game day snack or party food you can prepare ahead of time then fry up when you’re ready to enjoy them. We’re back to one of my favorite restaurants today with another Cheesecake Factory Copycat recipe (you can see all the Cheesecake Factory copycats here). This recipe is a favorite of ours like our other two favorites, Cheesecake Factory Chicken Madeira and Cheesecake Factory Spicy Cashew Chicken. Why make these egg rolls at home? When you order egg rolls from your local restaurant or even Chinese restaurants, in the time it takes for them to arrive at your home is the time in which they are best enjoyed. By the time they are delivered to you, they’ve already begun to get soggy, cold and the cheese inside is already starting to harden. Egg rolls are best enjoyed within minutes of them being fried. What is in the creamy avocado sauce? The creamy avocado sauce is a mixture of cream cheese, sour cream, cilantro and avocados. If you’d like a bit of a kick you can add in a pinch of cayenne or 1/2 a jalapeno. If you’d like to bake the egg rolls instead of frying then, spray the egg rolls with canola oil spray before baking. Bake at 425 degrees for 18-20 minutes. 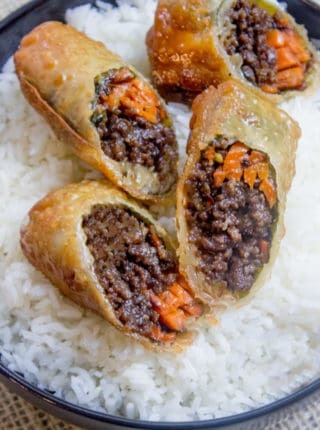 You can either fill and roll the egg rolls and freeze them before cooking or you can make the filling ahead of time and roll and fry them when you’re ready to serve. 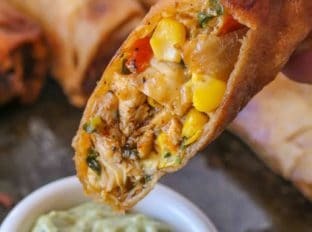 Dipping Sauce ideas for these Egg Rolls? Ranch…but only because so many people I know say ranch is the dip for everything, ever. 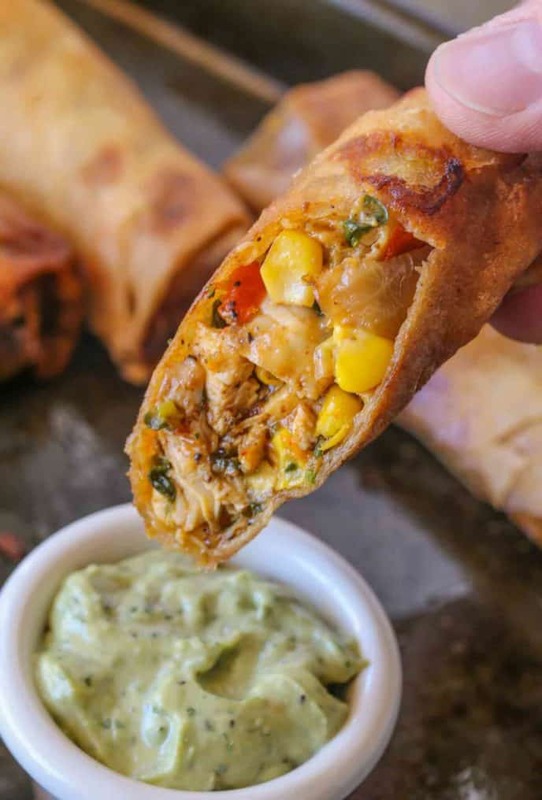 Chicken Fire Poppers – PS These are the PERFECT recipe to make with these egg rolls. Oil Thermometer: You’re looking for 350 degrees on your oil here. Everything inside is cooked but you want a good golden brown exterior and some melty cheese action inside. Tongs: I normally use the pig tail flipper for frying but because this has a filling to protect definitely go with tongs here. Slotted spoons or spatulas invite oil burns if the egg rolls fall back in (trust me on this one). 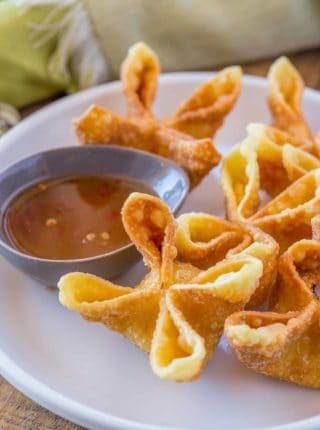 Cooling rack: Don’t cool on napkins or paper towels, they will cause steam to build up and a soggy half of your egg roll! Add the canola oil to a cast iron skillet on high heat with the chicken, onion, garlic, cumin, chili powder and kosher salt. Stir and cook for 1 minute before turning off the heat. Add in the corn, black beans, bell pepper, tomato, cheddar cheese and cilantro and stir together. Add 3 tablespoons of the mixture to the middle of an egg roll wrapper. Starting from the bottom left pull corner over the meat, then fold the two sides in. Wet the edges and roll tightly. Set a pan to heat with canola oil, about an inch high would do the trick. Add 3-4 egg rolls in them at once. Once they have browned, you can take them out and dry them on a cooling rack or brown paper bag. I made these for dinner tonight, my clan loved them!! Thanks for the recipe. They are yummy! The dipping sauce is a little too thick. What would you use to thin it out? Thank you! You can add more sour cream to the sauce to thin it out a bit for next time. So glad you enjoyed them! Can I use a spring roll wrapper instead of one for egg Rolland thus avoid frying? 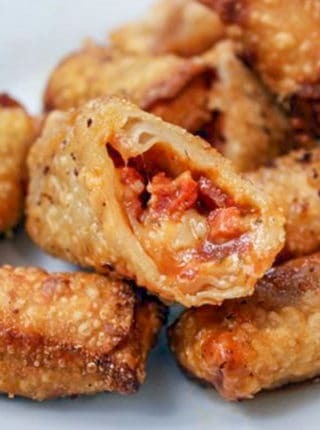 These really need to use egg roll wrappers and need to be fried to be a true copycat. I’ve never done them any other way. Is there an easier way to make the sauce? I had the cream cheese softening while I was making the dish but it was clumpy for me instead of creamy. I improvised and layered it on top before eating, and the meal was still delicious! Next time, try whisking or maybe even using a hand mixer just to give it a quick mix to break up the clumps. Hope this helps. Tasty but very oily. It needs a dipping sauce for sure. I can’t consume dairy so I tried a few different dipping substitutes. Can you bake these instead of frying. If so what temp and how long? I haven’t tried it but I’m sure you could. They won’t be as crispy but if you spray them with cooking spray or brush them with oil before baking, they should still get some crisp. I would suggest 400 degrees and they would probably need 10-15 minutes or until golden brown. Let me know how they turn out! How long should you fry these for?? Once they’re browned, around 2 minutes per side. I made these “delightful darlings” today and they are great!!! My son could not stop eating them. I made only half of a batch today (8), but will make the entire batch this weekend. Made this and its good. The dipping sauce completed the taste, the only different thing I did was add salt in the dipping sauce. I was going to freeze some (before frying), problem with that is the wrapper absorb the little sauce in the mixture and becomes sticky and breaks. I will try freezing after frying and see if it will be still good. Substituted with spring roll wrappers instead and it was delightful. Great recipe. I’m glad you were able to customize them to your liking! Can these be frozen if they aren’t all eaten? We’ve never had any left to freeze so I’ve never had to try it but I don’t see why not. Help! These sound so awesome but I don’t have eggroll wrappers on hand. Do you think I could substitute burritos just this once??!! I haven’t tested it before so I can’t really give a recommendation. Let me know how it turns out if you decide to try! I’d call that a win, haha! So glad you enjoyed it! 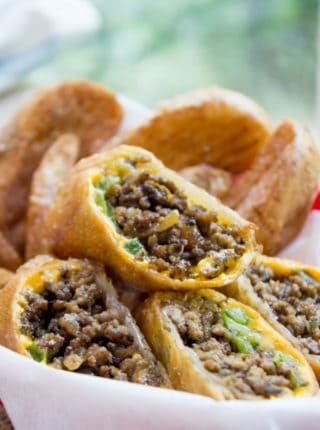 I love that place and these egg rolls look the bomb! Oh my, these look SO delicious!!! I love all the flavors!! My husband really loves these, so I can’t wait to make these at home!! Perfect party food idea! Love this recipe! This looks really good and really flavorful! Such an amazing appetizer! These would make such a great appetizer! I always order these egg rolls whenever I’m at the Cheesecake Factory – love that I can now make them at home! Perfect! No need to go out now and fight the wait times there!